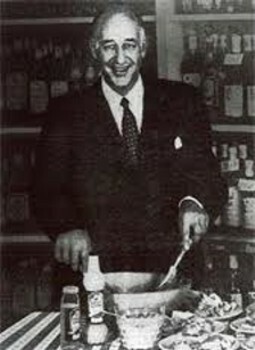 The “Caesar” originated in Tijuana at Caesar Cardini’s restaurant. According to Rosa (Caesar’s daughter), her dad invented the dish on a 4th of July in 1924 when he had a rush of hungry customers who depleted his restaurant’s culinary food supplies. So, still having more customers, he was forced to use just what little he had remaining and that’s when he came up with the Caesar Salad. And because he was such an interesting and theatrical kind of guy, he made a big show of serving it. Voila, the very first Caesar with a proper flair. According to Julia Child (9 years old), she and her parents in the 1920’s actually had the privilege of witnessing his making the salad at their table. She and his daughter reported that originally he did not use the outer leaves of the romaine; he just used the inner heart leaves, washed but NOT torn. He then arranged them on a plate to be picked by hand to eat. However, supposedly customers complained about oily dressing inundating their hands so Caesar changed the recipe to the torn leaf of the whole romaine head version. However, sometimes I think that it is fun to do it Caesar’s very first way and serve it to guests with lots of napkins. I wonder what Caesar would have thought of our now very often served Caesar salad spears for appetizers. Since when Caesar first invented his salad it has become, as we all know, a favorite of many not only in the USA but world wide and has evolved into all types of variations. However, this original way of making I think is the best. 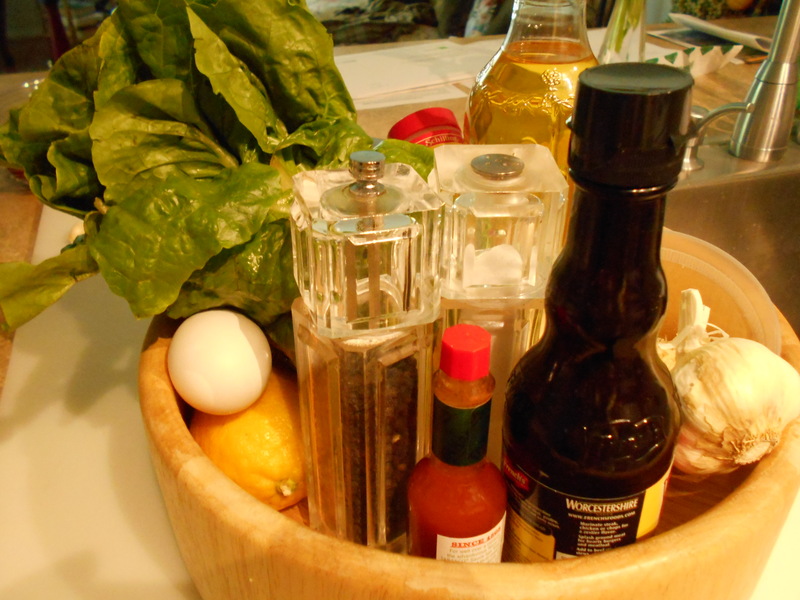 It is far better than just throwing the romaine with a homemade or store made Caesar salad dressing. So give it a try, which is if you are not scared of using pasteurized or even non-pasteurized raw or coddled eggs. I am not. By the way, as I remember, in all of the finer restaurants in San Francisco, the waiters made this right in front of your eyes at your table and it was a sight to behold. You too can do this and have a little culinary fun and flair in your life right in front of your family or guests. In fact, maybe even the kids might want to give it a try. 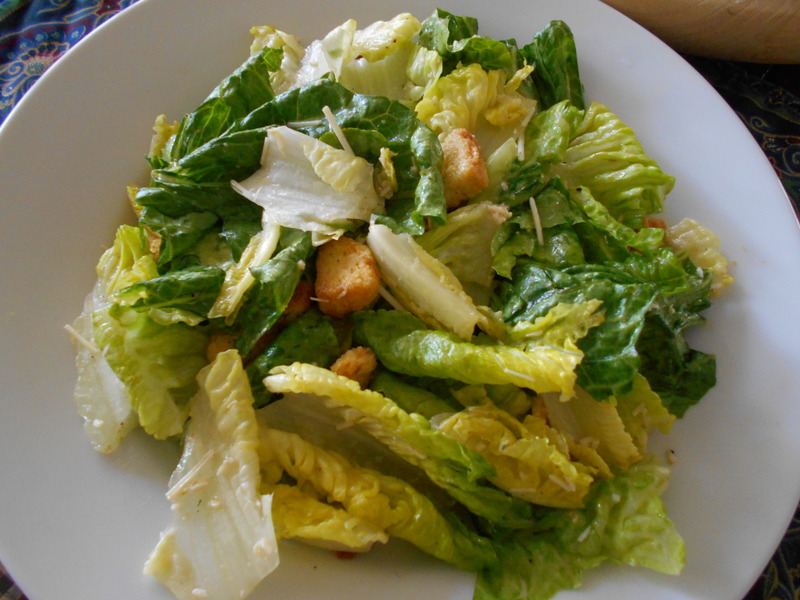 In tossing his salad, Caesar put the dressed romaine leaves in the bowl and drizzled the 2 Tblsp. of olive oil over them—lifting the leaves from the bottom and turning them towards you so they tumble over like a wave. Then he sprinkled them with some salt and pepper ground before your eyes, tossed once or twice more; then he added the lemon juice and several drops of the Worcestershire; then he tossed again and tasted. If it tasted OK, he cracked the egg and dropped it right on the romaine leaves, then tossed to break it up and coat the leaves. Then he sprinkled on the cheese and tossed once more briefly before finally adding the croutons to toss for the last time. He then arranged 6 or more leaves in a single layer on individual plates, scattered the croutons all around and voila—sticky fingers but delicious eating. 1 large peeled garlic clove well rubbed on the bottom of your wood salad bowl. You can split the garlic if you wish (sometimes I use 2 because I LOVE garlic) and I also sometimes sprinkle some salt on the bottom so that the garlic grates better. I don’t believe that Caesar originally did this however he made his own garlic croutons and supposedly sometimes after having sautéed his croutons he used the butter/garlic pan remains to add to the salad. However, I feel that the garlic rub is an important element of the Caesar and I do recommend doing it unless you really hate garlic. 2 Heads of fresh and chilled Romaine leaves gently torn with your hands in bite size pieces placed in your salad spinner—spray washed and spun dry (make sure the leaves are DRY) or do the original and just use the heart leaves UNTORN, washed and spun very dry. You should have 18-24 heart leaves. In a wood salad bowl, rub the bottom well with the 1 peeled and cut garlic clove and some salt. Drizzle the 2 Tblsp. olive oil over the leaves and toss. Remember not to toss too much because you don’t want to bruise the leaves. However, you do want your leaves to have a glistening look. Also, remember to think when tossing: waves of the ocean coming towards you and toss high and towards you. Concentrate, be dramatic and smile while you are doing this. Also remember that you can increase or decrease the ingredients according to your taste.